Ten years since financial markets crashed in the United States (U.S.), the world economy is anything but near so-called “recovery.” Far from it: global economic growth is still slower since the crisis. Investment, which includes flows of capital for new production and for buying up other companies, declined for 2017.1 Global unemployment is estimated at 192 million for 2018.2 “Global value chains”, production networks controlled by transnational corporations (TNCs) which benefit from lower labour costs, are said to be slowly declining.3 Economies in the global South are threatened with the possibility of debt crises that could unravel in the next years. If anything, the 2008 financial crash exposed to the public the faults in the neoliberal policy that had been promoted for at least four decades by U.S.-dominated international finance institutions such as the International Monetary Fund and the World Bank Group (IMF-WB). With liberalised and de-regulated finance, the market for various and complex “financial products” grew in the last decades—resulting unstable bubbles of speculation had burst in the early 2000s and again in 2008. With Southern economies opened up to varying degrees by neoliberal policy, TNC-led “value chains” emerged to maximize cheaper labour, production costs and inputs. Today’s huge global debt, and especially debt in the global South, is still linked to the U.S. and other central banks’ “response” to 2008. These banks “printed” more money to lower interest rates which, among other effects, later led big private corporate lenders to run after Southern countries with the higher interest rates and therefore higher returns for lenders. Source: EPI analysis of data from “Earnings Inequality and Mobility in the United States: Evidence from Social Security Data Since 1937,” by Wojciech Kopczuk, Emmanuel Saez, and Jae Song, The Quarterly Journal of Economics, February 2010; updated through 2013 with data from the Social Security Administration Wage Statistics database. 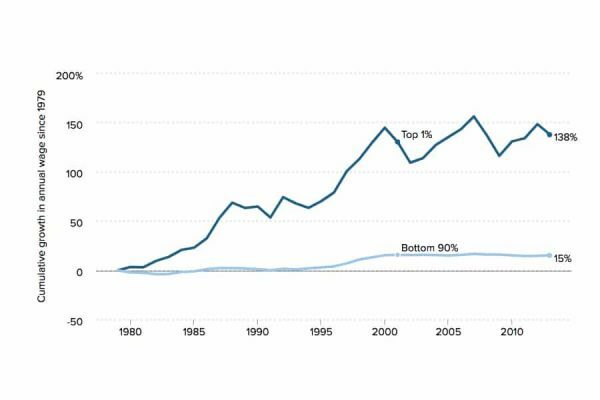 Reproduced from Figure F in Raising America’s Pay: Why It’s Our Central Economic Policy Challenge, by Josh Bivens, Elise Gould, Lawrence Mishel, and Heidi Shierholz, Economic Policy Institute, 2014. In this way, the 2008 “crisis of neoliberalism” continues in a protracted fashion today; and this is also part of a longer history of crises and the longer trend of slowing economic growth even in industrialised countries of the current world economic system. Among others, a “global New Deal” has been proposed. The proposals predictably involve greater regulation but resist any suggestion of changing the fundamental character of the profit-driven world economy dominated by monopolistic, international capital. These efforts are nakedly concerned only with saving the world economy until the next crisis, and in that sense merely repeat and intensify patterns of action established by neoliberalism, which emerged during crises in the 1970s. Most urgent today is the need for fundamental social and economic reforms at both national and international levels. The membership of Southern countries in the IMF-World Bank as well as the WTO should be reviewed and re-examined given its effects on people’s rights. For Southern countries, people’s sovereignty—meaning the active participation of people’s and grassroots organisations—must be an essential premise for those committed to establishing development policies that actually benefit those at the bottom. This principle could serve to ensure that policy direction is actively led by the grassroots organisations—instead of being dominated by the IMF-WB and WTO prescriptions—so that long-standing demands, and broad social and economic rights, can be attained by the working classes. This could be, for instance, towards greater public spending for strategic industrial development, rural development and agrarian reform. With people’s sovereignty as a key guiding principle, various policy tools could be utilised. For example, establishment of controls of the flow of capital, regulation of foreign investment and foreign borrowing; repealing taxes that put burden on the poor with corresponding progressive taxation of domestic elites and TNCs; halting “transfer-pricing” and other illicit financial flows; the re-examination of current Southern government debts for possible cancellations; budget re-allocations away from military spending; and even the use of monetary policy targets pegged not on inflation targets but on employment and towards greater equality. This would mark an important step toward the goal of economies oriented to need and governments capable of carrying out democratically-led development strategies—instead of filling up the pockets of financial executives, big shareholders, corporate managers and elites in governments. ↩ UN Conference on Trade and Development. 2018. World Investment Report 2018: Investment and New Industrial Policies. ↩ International Labour Organization. 2018a. World Employment and Social Outlook 2018: Trends. ↩ International Labour Organization. 2018b. Women and men in the informal economy: A statistical picture. ↩ Carballa Smichowski, Bruno, Cedric Durand andSteven Knauss. 2016. “Uneven development patterns in global value chains. An empirical inquiry based on a conceptualization of GVCs as a specific form of the division of labor.” Working Paper. ↩ UN Conference on Trade and Development. 2018. World Investment Report 2018. ↩ World Trade Organization. 2017. Global Value Chain Development Report 2017: Measuring and Analyzing the Impact of GVCs on Economic Development. ↩ Rodriguez, Antonio. “World unprepared for next financial crisis: Ex-IMF chief.” The Jakarata Post. 9 September. ↩ BBC News. 2018. “Europe and nationalism: A country-by-country guide.” 10 September. ↩ Mishel, Lawrence, Elise Gould and Josh Bivens. 2015. “Wage stagnation in nine charts.” Economic Policy Institute. ↩ Diez, Federico and Daniel Leigh. 2018. “Chart of the week: The rise of the corporate giants.” IMF Blog. June 6. Amy Padilla is the Executive Director of IBON International (www.iboninternational.org), a Southern international non-government organisation that engages in capacity development for people’s rights and democracy around the world. She has been a development worker for over two decades.